Chris Baker was leading a youth group encouraging kids to make a difference in the community. A lifelong artist, he was intent to bring artistic activities into the youth group’s focus. The kids and Chris came up with the idea to paint artistic murals over the walls of buildings defaced by gang graffiti. That idea set in motion the answer to the prayer Chris had been praying since he had discovered faith in Jesus as an adult, “God, show me what I can do to serve and bless people.” Chris realized gang markings went beyond graffiti on buildings; gangs relied on body-altering tattoos to signify everything from allegiance to the gang hierarchy to keeping tallies of violent criminal activity. He realized his greatest artistic love, tattoos, was to become his ministry calling, covering up the markings of dark and destructive lifestyles with beautiful works of art. INK 180 was born. Chris approached a friend who served in local law enforcement and the INK 180 concept was immediately affirmed as not just a good idea, but a desperate necessity within law enforcement. Former gang members are prevented from attaining good job opportunities, they are always under scrutiny from law enforcement, and sometimes they are even targeted for reprisals because of their markings, regardless of their best intentions and efforts to leave the destructive lifestyle. 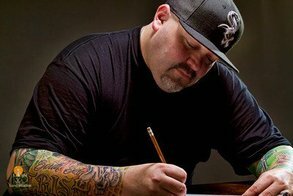 With this encouragement, Chris began to travel into the correctional facilities and to expand his partnership with law enforcement all around the Chicago area to provide this life-changing ministry to those trying to exit their destructive pasts. It was during a meeting with Homeland Security’s gang division that Chris was invited to discuss his ministry with another unit upstairs, the human trafficking operations. Suddenly, Chris was invited into a horrific underground world few see clearly in the United States. Hundreds of young women, many of whom are domestic victims & runaways, held captive by organized crime, gangs, drug dealers, lies, abuse and threats. They are forced into prostitution and moved into major metropolitan areas including Chicago. They are typically tattooed by their captors so that if they are ever found, they can be tracked back and returned to their ‘owners.’ These tattoos are sometimes names, but often bar codes that can be scanned with smart phones…and sometimes the victims are even branded and scarred like animals. And though the officers wanted to help these girls, cover-up tattoos can cost hundreds of dollars a piece, and there are hundreds of girls being removed from these horrible situations every year. There just isn’t money available. So they appealed to Chris’ INK 180 ministry to consider taking on human trafficking in addition to gang cover-ups. Chris was blown away, his heart broken by the volume of the pain suddenly revealed right in front of him. He immediately agreed to help and began work on numerous victims of human trafficking moving through rehabilitation and relocation process through law enforcement channels. He covers up their vile markings with beautiful artwork, flowers of pink and purple, bright hearts, shooting stars, whatever the girls’ want. They love to choose the art, the colors, the images, but most of all, they love to have the vile markings made invisible. Chris has covered destructive markings since he began in October of 2011. INK 180 exists to offer the opportunity for a real second chance to the least of these, the invisible, the forgotten, the discarded. Chris provides his time, supplies, artwork, entirely free of charge to the victims. INK 180 is entirely funded by donations, no charge is ever asked of the people receiving Chris’ ministry. He cannot operate any other way; beautiful second chances are totally free, already paid in full by the One who paid it all. They were for Chris, they are for us, so they must also be for those with so much already suffered. INK 180 needs your help. INK 180 is entirely funded by donations from people like you. INK 180 charges nothing to the people it helps, it never will. INK 180 does not exist for profit or gain; it only exists to help people live out their second chance. Whether you can give a little, or a lot, INK 180 will use your donation to change a life in the most literal way that it can, through covering up gang and human trafficking tattoos with something beautiful.